I know it’s Halloween, and all, but there are still other things (too many things!) to blog about like this unique baby shower I threw for my sister-in-law this weekend, the furniture makeover project that is nearly completed (featuring the Dutch Boy paint that they were so gracious to send me some time back), and I still need to answer some of your robot party questions. We did film a video about the cake stand, but it’s pretty lengthy, so I need to figure out how to edit it, or film a new reader’s digest condensed version. What software do you use to edit video? 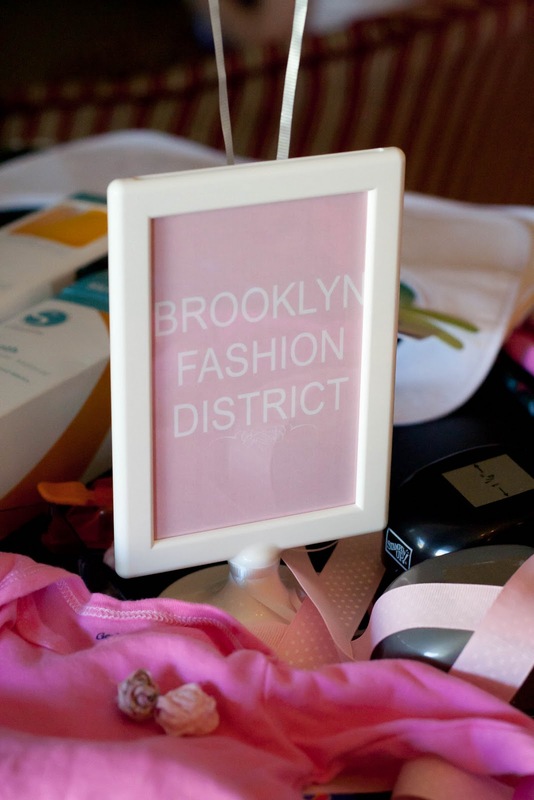 But for now, I give you a Brooklyn baby shower…. My sister in law is having her 2nd baby, but her first girl and I offered to throw her a baby shower. Truth be told, part of the reason I offered was because I thought of a fun theme that I was excited to use for her shower. It was decided long ago, that this girl would be named Brooklyn (her brother is named Jackson–another city name). I thought it would be great to use her name and the city she is named after as the inspiration for the shower. 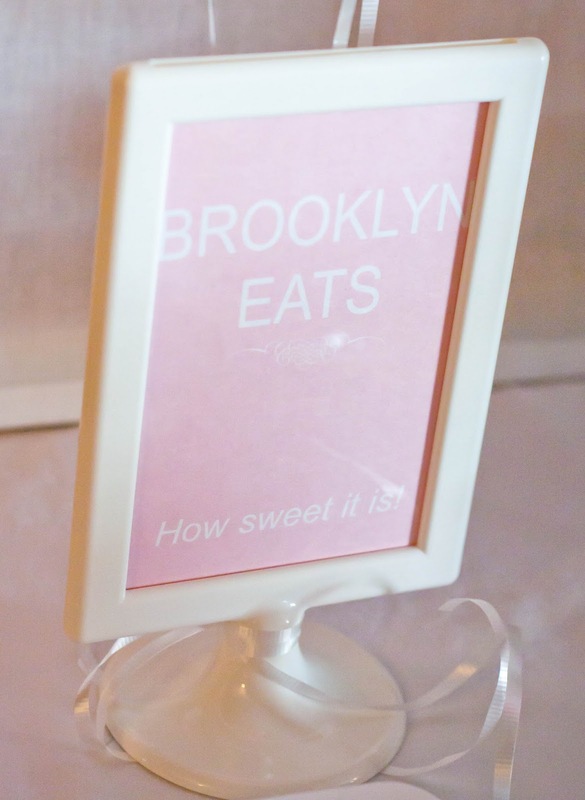 I’m not sure the guests all understood when they received their invitations (above), since Arizona is miles away from Brooklyn, but does this look familiar? 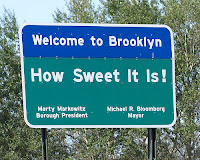 I printed those invitations on white glossy paper (leaving a white border) and rounded the corners, so they looked just like the real “Welcome to Brooklyn” signs, only girlified (Wonder why spell-check doesn’t like that word?). 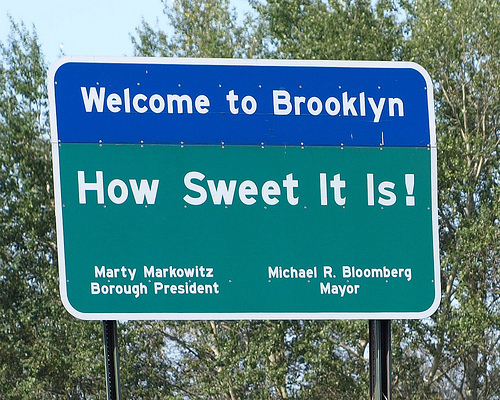 A larger “Welcome to Brooklyn” sign greeted the guest at the front door. The food table was the focal point. 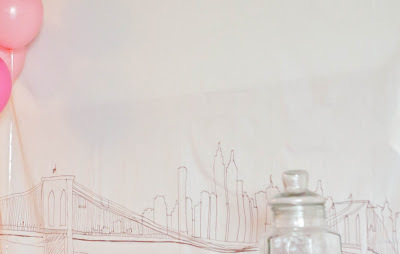 I created the backdrop sometime ago, using an inexpensive white sheet from IKEA, a projector and a brown sharpie marker. I had been thinking to do pink, black and white, but was inspired by the brown cityscape on this line from Fishs Eddy and the brown seemed to soften everything a bit for a baby girl. You can see a little more of the mural here (w/out all of the serving dishes). I wanted the food display to have a lot of height, to replicate the feeling of the tall buildings of the city. 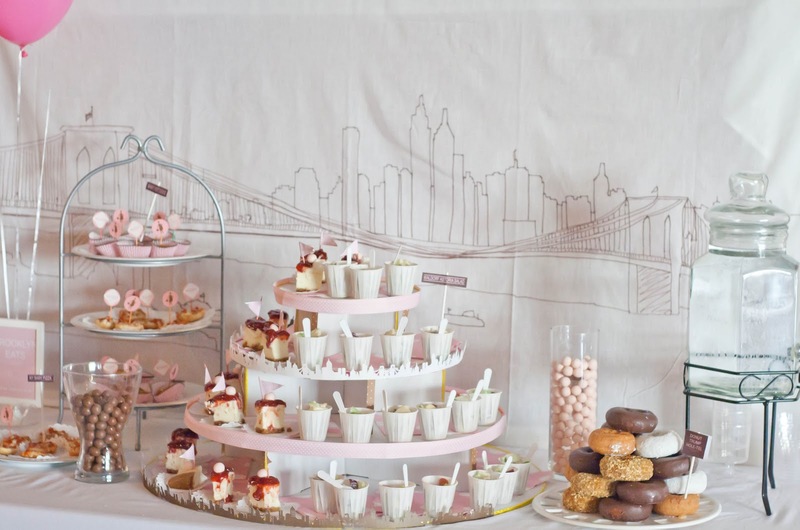 I borrowed the cupcake stand from a friend and covered the edges with coordinating ribbon and paper cut-outs of cityscapes. 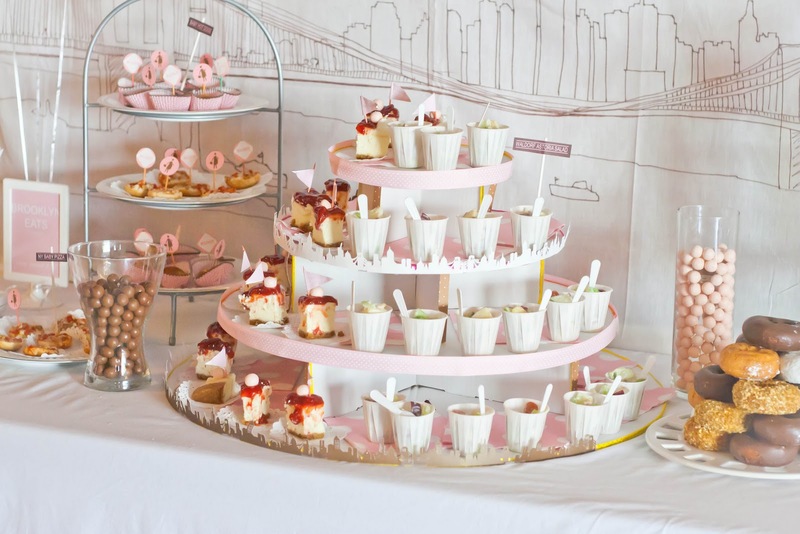 The food was carefully chosen to represent foods that New York is famous for, but in a baby way–wherever possible. I made “street signs” out of lollipop sticks to serve to identify the food and keep the city feel. We served NY Baby Pizzas, (Actually these are Bagel Bits pizzas. Bagels are another NY food I thought about serving.) 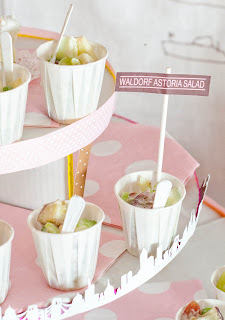 mini-hotdogs (in the cute polka-dot cupcake wrappers), Waldorf Salad, NY Cheese cake, donuts, and the regular and strawberry flavored Whoppers candy–mainly for the colors. 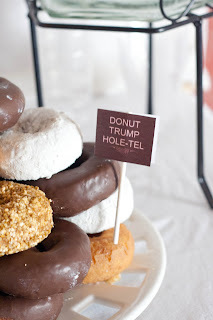 The donuts were actually supposed to be donut holes, and I had planned to skewer them into a tall piece of foam to be my “Donut Trump Hole-tel,” but my SIL couldn’t find donut holes at the store that morning, so we just stacked up these full-sized ones. 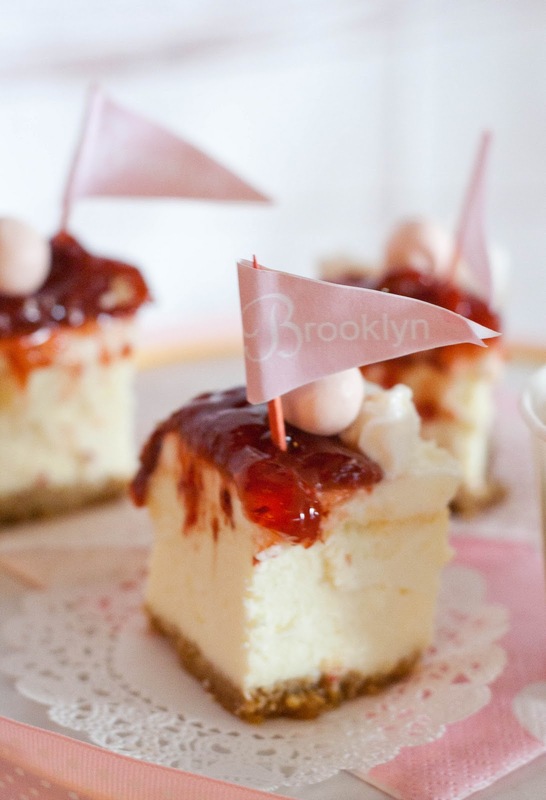 I made little pennant flags that said Brooklyn to go in the cheesecake. I actually have to thank my 9 year old for assembling all of the food picks, including these bump signs and pregnant woman crossing signs. I thought they were the perfect way to tie in the city theme with pregnancy and baby! Of course, New York is known for more than just food. 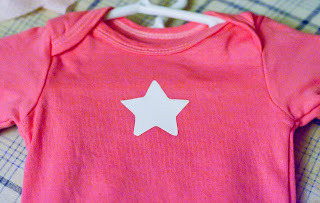 We also had our own “Fashion District” where we turned ordinary onesies into high fashion, one-of-a-kind works of our for our little diva-to be. I purchased plain white onesies in multi-packs and dyed them in shades of pink and purple before the shower. My husband actually got a little creative while helping me with the dye and ended up tye-dying a few. They turned out really cute but I didn’t get a picture of them. I wasn’t sure how to display the finished creations–a clothesline seemed to rural for our urban party. 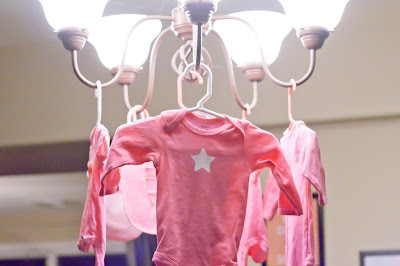 I discovered an easy solution by just using hangers and the chandelier above our work table. 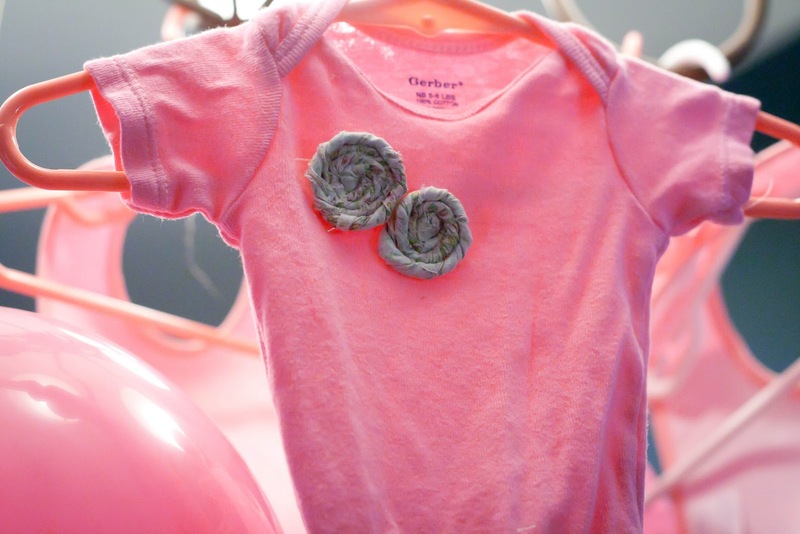 One of our party guests decorated this onesie with beautiful fabric rosettes she made. I made these two, but I’m not going to tell you how this week, because it is a subject that will get it’s own post and may involve some thing that rhymes with a schmiveaway (*wink*). Are you excited? 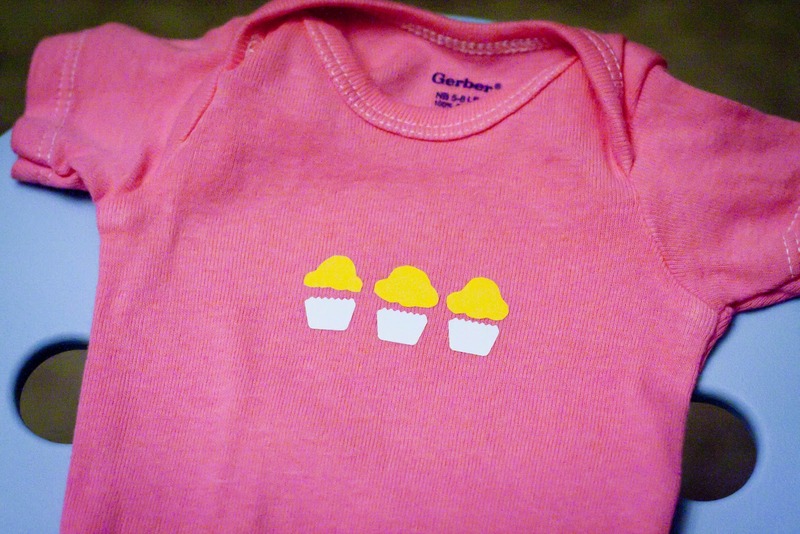 So now, we are ready for little Brooklyn to make her debut! 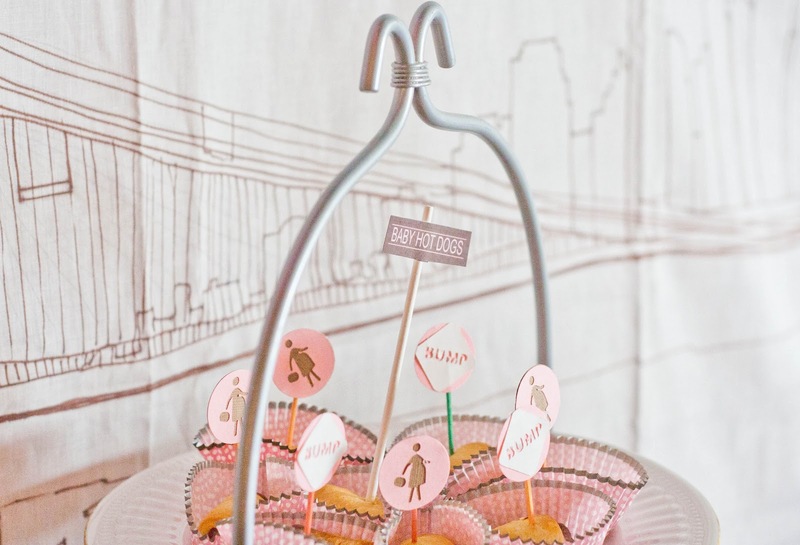 This shower theme may not be one that you can copy exactly (do you know any little Brooklyns? 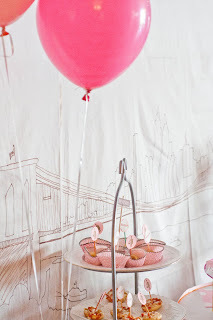 ), but you might use some of these ideas for a travel/bon voyage type party. What about other place names? Think of the showers you could throw for a baby Paris, Vienna, or India! Oh, and my apologies to any real New Yorkers if there are inaccuracies or stereotypes here. Sadly, I haven’t been to New York since 1993, and I’m not sure I ever made it across the Brooklyn Bridge. 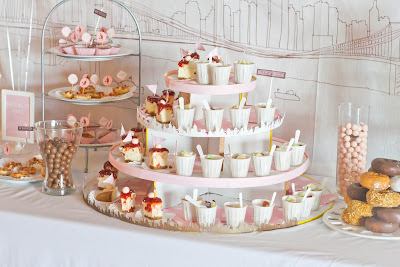 What is the most unique theme you’ve seen or done for a baby shower? it is Great Job! Awesome, beautiful! i love it! So pretty! I love the backdrop! My hometown! Love that name as well! Sooo sweet this shower! Love the Donut Trump Hole-tel LOL! Great job! great job Kendra!! Such a unique idea….and your execution is completely flawless! How cute are those onesies? And your backdrop is GENIUS! Sheets from IKEA will be on my list next time. I'm always wanting a cute backdrop, but to buy that much fabric is EXPENSIVE! I love the line drawing. The tiny salads are adorable too. It's all just completely fantastic! this is SO great! I have already been thinking about a Brooklyn themed party for my hubby's milestone birthday (his original hometown) and you have given me a lot of inspiration! I lurve it! I was born and raised in Brooklyn and although it's been many moons and I can't claim I a Noo-Yokah, this tugs at the heartstrings! The backdrop and name plates are outta control! You know I gotta share! The little paper cut-out city skyline around the stand just blows by mind! GORGEOUS! OH MY… this is by far one of my favorite. 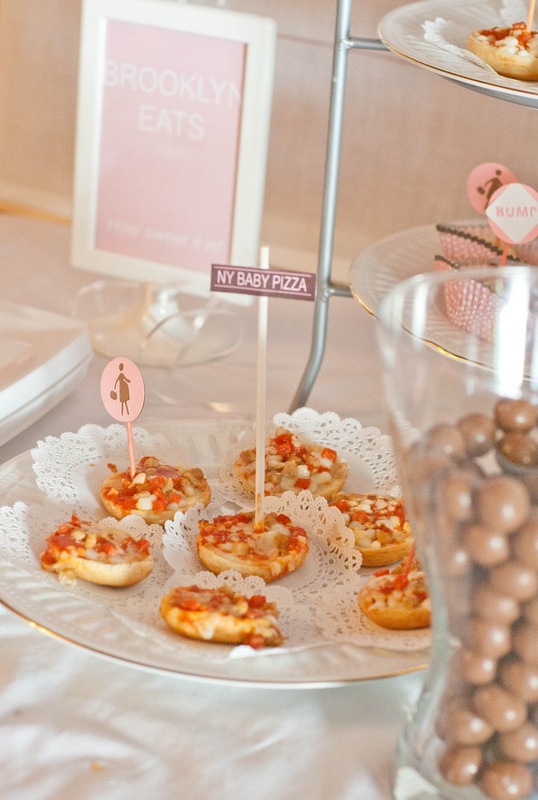 Love the level of creativity you did for this baby shower! 100% Love it!!! So cool! I love the skyline! I bet the mom-to-be was THRILLED! Your table looked absolutely lovely, very feminime and delicate looking – you certainly have artistic flair. So clever and so beautiful!! 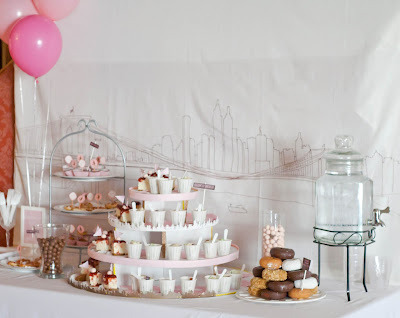 You are the queen of party concepts and and decorations! I loved how the little details tied in with the "actual" Brooklyn! It was adorable! What darling ideas! 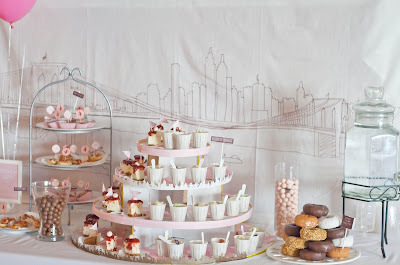 Love the soft pink signs and the skyline mural is a great touch! Darling, darling ideas with this baby shower. Love the shade of pink you used. Love your blog – glad I found it! Ok Kendra – this is to die for!!! LOVE it!! You throw the most awesome parties!!! I am featuring it in a bit. Love it! Wow, another super original and creative party! I adore your theme!!! So fun and well done. I love all your details and am dying over your hand sketched backdrop!!! 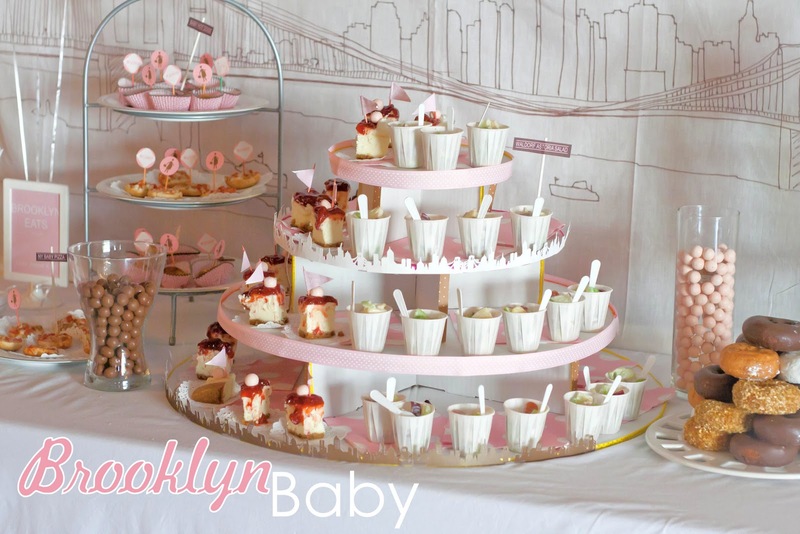 i love this theme..our 1st born due this december will be named Brooklyn and we are having a NY/Brooklyn themed baby shower..how did you make the invitations we would like to use those; very creative and we havent had any luck finding the right invitations for our shower. Perfect, Roni! I just designed the invitations on my computer, copying the layout of the Welcome sign in Brooklyn. If you are in a lurch, I might be able to customize my invitation for you to print for a small fee. Email me at kendrascreations@gmail.com if you want to discuss. Hello this is so cute! 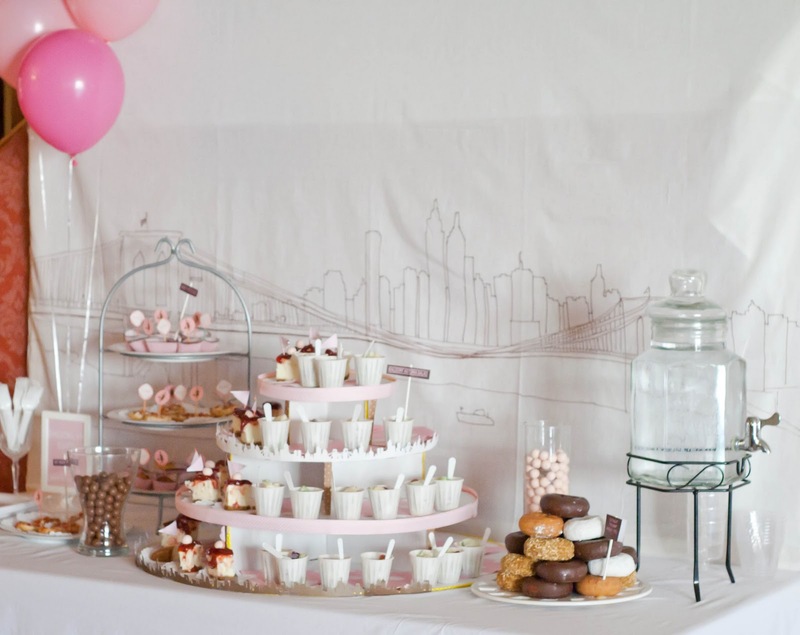 I am using this to plan my daughter, Brooklyn’s 1st birthday party. I was wondering if you had thought of a cute label (Brooklyn themed) for the mini hot dogs?